More trouble with cheesy electronics in appliances. This time, it’s the Whirlpool-built (includes KitchenAid) built-in combination microwave ovens. In this particular inconvenience, error code “door” appears in the display and the microwave oven shuts down in mid-cycle. When restarted, the microwave will shut down immediately again and show the “door” error code. The microcomputer control board (more on that in a minute) will throw this error code whenever it detects an open circuit in the door interlock switch circuit (such as when the door is actually open– go figure!). Hooold on there, Bubbalouie! Uncross them eyeballs and lemme ‘splain what that means. The door interlock switches are the little switches inside the cabinet where the door catches go in and hook when you close the door. They call ’em microswitches in the trade (I suppose to distinguish them from macroswitches). You can tell the PIS from the secondary interlock switch (the SIS- not shown here) because it’s the one with a red and black wire attached to it. How’d I know that? It’s printed right on the wiring diagram. You see, Grasshoppah, a wiring diagram is nothing more that a road map for wires (and, more interestingly, electrons). Generally, if you can read a road map and fog a mirror, you can read a wiring diagram well enough for most DIY appliance repairs. Anyway, you’ll need to get to the PIS (some disassembly required; unplug the microwave first and watch out for the high voltage capacitor— it holds a 2,000 volt charge… even when unplugged!). And then check the continuity of the switch while actuating it (pressing the little tab in and releasing it). Referring again to the wiring diagram, the PIS is just one of the three components that, if open (or bad) will cause the microcomputer to throw a “door” error in the display. You’ll also notice that there are two fuses in that circuit: a 20amp and 15 amp fuse in series with each other (that means they’re on the same line). If either one of those fuses are open, you’ll get the same error in the display. So, you need to do a continuity check on both those fuses with your multimeter. If any three of these things are open– the PIS or either of the two fuses– you’ll get “door” on the display. If you check all those and they’re good, then you’re probably looking at a bad microcomputer control board. This microcomputer controls the operation of the microwave and monitors the position of the oven door. As you might expect, this is not something that can be adjusted or corrected by replacing the out-of-spec component on the board. No, the entire microcomputer must be replaced. 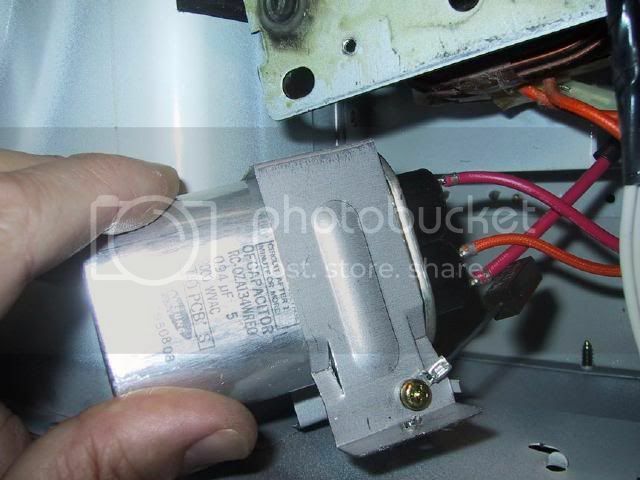 This entry was posted in Microwave Ovens, Oven Repair on November 14, 2008 by Samurai Appliance Repair Man.